The riveting true story of a young man's descent into opioid and alcohol addiction, homelessness and violence, and his recovery journey-told by a son, now seven years sober and co-founder of a substance abuse treatment program, and his mother, a spiritual director and youth minister with more than twenty-six years of sobriety. 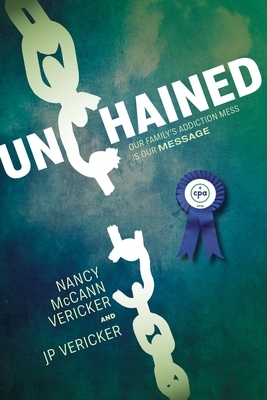 Unchained: Our Family's Addiction Mess Is Our Message is the inspiring story of one family's efforts through their faith, the 12-step program, and a tough-love approach to help their son return home-as did the prodigal son of the Gospel-to forgiveness, love, and a renewed life. This book will provide hope for families grappling with the dark world of addiction. Nancy McCann Vericker is a spiritual director, youth minister, and retreat speaker. She holds a master's degree in spiritual direction from Fordham University. She has worked as parish coordinator of family faith-building programs and teaches a Bible study for women in her parish. She and her husband, Joe, a professional photographer, have been married since 1983. The couple has four children and lives in Westchester County, New York. JP Vericker is co-founder of Northeast Addictions Treatment Center in Massachusetts. He is board certified in the treatment of addictions. He began his work in the substance abuse treatment field as a night shift technician and has worked his way up in his career through a variety of positions including halfway house manager, detox counselor, detox manager, marketing consultant, licensing consultant, and therapist. He lives in Massachusetts.